Bangkok is a backpacker's paradise and is the ultimate destination for tourists on a budget. 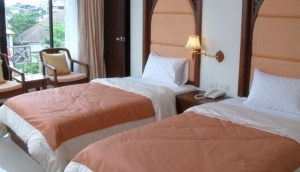 Quality budget hotels and guesthouses are so plentiful that they appeal to all types of visitors, and not just those travelling on a shoestring. Bangkok might be a cosmopolitan city that caters for the high-end tourists looking for luxury , but it has still retained its reputation for offering good quality, budget accommodation. It is possible to be right in the heart of the action, or a stone's throw from the main tourist attractions, bars and restaurants, whilst still being able to find somewhere to stay that is not going to cost over your budget.From charming little places, to basic, clean rooms with a fridge and a TV, being on a budget in Bangkok does not have to mean roughing it by any means.